First of all, who is Knife? Enjoyed by all since 1948, Knife Cooking Oil has been the household name for many generations. Its proprietary blend and unique peanut aroma give consumers total satisfaction with great tasting dishes. The ever popular Knife Cooking Oil is Trans Fat Free, rich in Vitamin E and has No Cholesterol. Knife is the No. 1 top-selling brand of cooking oil in both Malaysia and Singapore. It is the only cooking oil brand voted as Reader’s Digest Trusted Brand for 12 consecutive years. Why did they use the promotional Angry Birds ceramic bowl as a promo gift? The promotional Angry Birds ceramic bowl is a great promo gift. 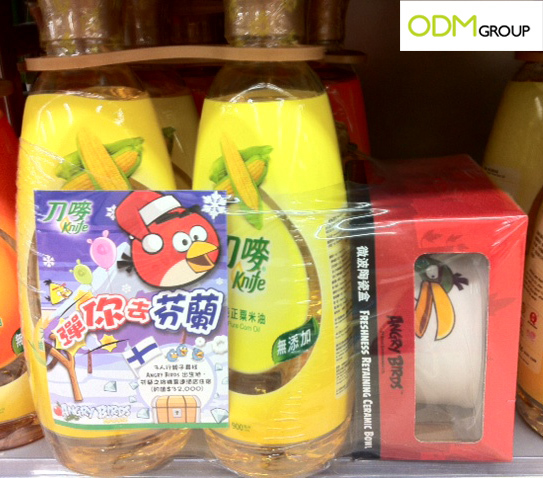 It is licensed with the renowned Angry Birds character which will attract many Angry Birds fans. It can be used as a bowl to store food or other small items. This ceramic bowl is long-lasting and durable. How can a promotional Angry Birds ceramic bowl affect sales? It will stir impulse purchases among consumers and encourage customers to buy 2 bottles instead of just 1 bottle. Knife may brand its logo on the ceramic bowl to increase brand awareness and attract new clients to buy the Knife cooking oil. It will boost brand recall as everyone will think about Knife cooking oil when they use the bowl. It serves as a reminder advertising to existing customers. This will encourage the customers to make more repeat purchases. Thus, this increases sales.